Department of Economics, University of Konstanz, Konstanz, Germany. Received July 24, 2009; revised August 29, 2009; accepted October 3, 2009.
such that investors might be better off. severe financial crisis which spread around the world. linked to an interest rate index after two or three years1. ernment on December 6th, 2007, is an interest rate freeze. tigate the implications of an interest rate freeze. seniority: several rated tranches and an equity tranche. also be analysed in this paper. portfolios underlying the different RMBS transactions. downgrades necessary as observed in the markets. ers evade this payment shock, foreclosure rates decrease. 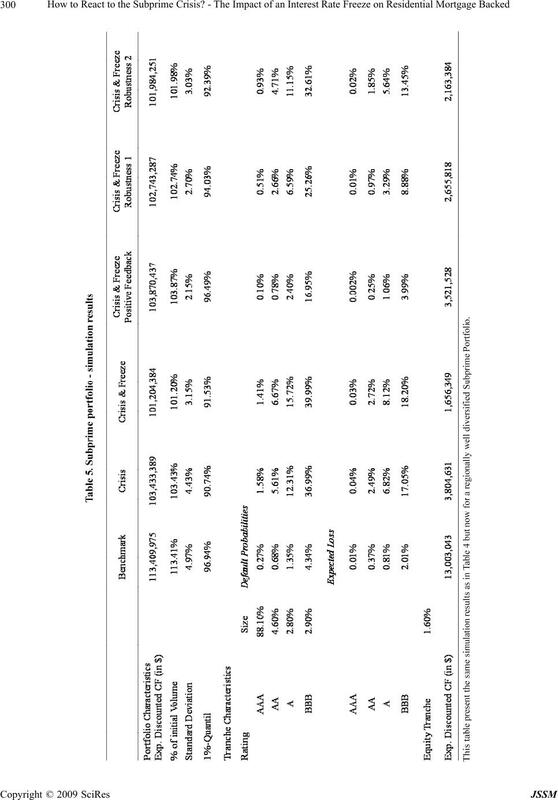 the equity tranche which takes most of the crisis losses. The remainder of this paper is structured as follows. scribes the set-up and calibration of our simulation model. portfolio and tranche characteristics. Section 5 concludes. securities and comment on the ratings monitoring process. large downgrade wave of RMBS tranches in July 20073.
ratio of the mortgage loan, and the debt-to-income ratio5. 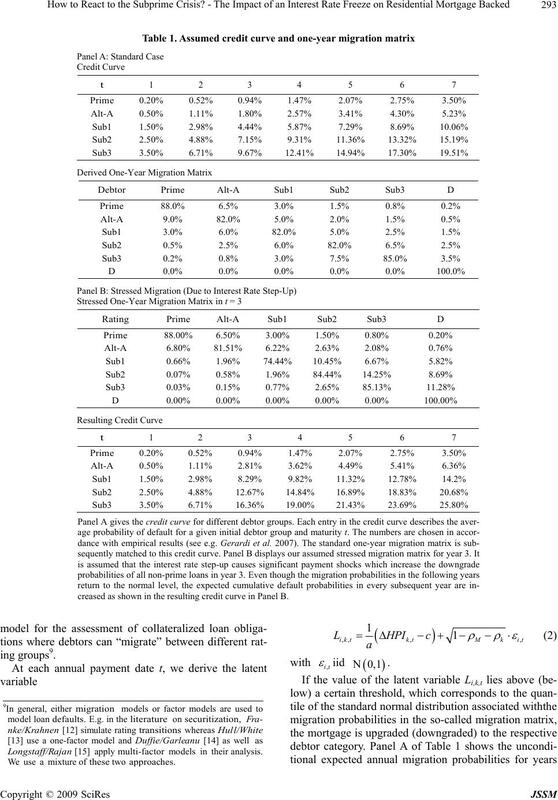 evidence for risk-based pricing in the subprime market. 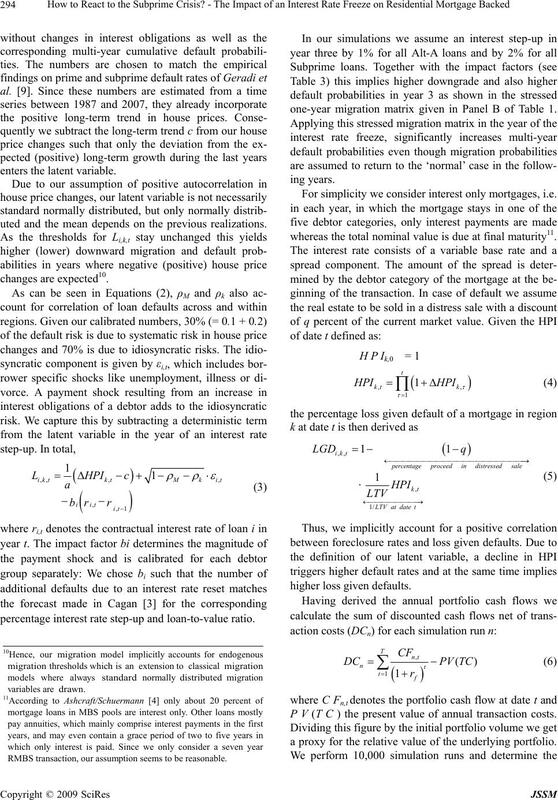 res, loan grades and loan-to-value ratios. increased, which made the mortgages more risky. on which the authors do not comment. is no significant correlation to the change in house prices. unemployment rates increase credit losses. Our analysis is based on a cashflow simulation model. usually triggered by a downturn in the house price. distressed sale following a foreclosure. the idiosyncratic debtor component of our model. both, the regional as well as the national level. like payment history and bankruptcies8. respond to empirical evidence . and 5.2% regionally, since 1975.
between Prime, Alt-A and Subprime. creased as shown in the resulting credit curve in Panel B.
uted and the mean depends on the previous realizations. percentage interest rate step-up and loan-to-value ratio. one-year migration matrix given in Panel B of Table 1. For simplicity we consider interest only mortgages, i.e. whereas the total nominal value is due at final maturity11. RMBS transaction, our assumption seems to be reasonable. P V (T C ) the present value of annual transaction costs. a proxy for the relative value of the underlying portfolio. tistics like mean, standard deviation and 99%-quantile. uced to zero, the next tranche is used to cover the losses, etc. one representing the US mortgage market as a whole. compositions are given in Table 3 in the appendix. Transaction Costs 1% p.a. 1% p.a. spreads are paid in addition to the risk-free rate of 4%. other two portfolios are well diversified across all regions. 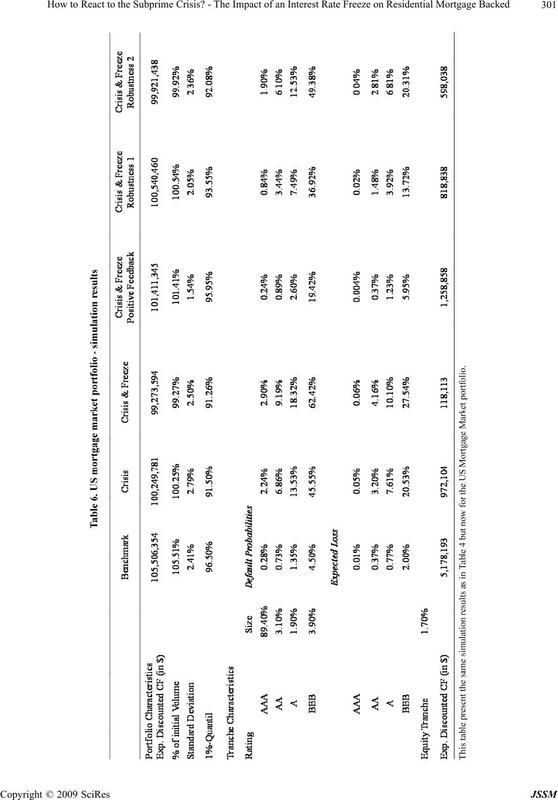 cumulative default rates as shown in Panel B of Table 1.
default rates of these loans stay the same. p.a., with a standard deviation of 2.4% over seven years. before any interest payment to the tranches. for the respective rating classes and a seven year maturity. which is due to a worse regional diversification. prices, whereas South Central saw an appreciation of 6%. pendent of possible downward migrations until the reset date. 90% in the last three years. ates on average 22% less than the area average appreciation rate. Mortgage Home Price Index but pooled some neighbouring regions. 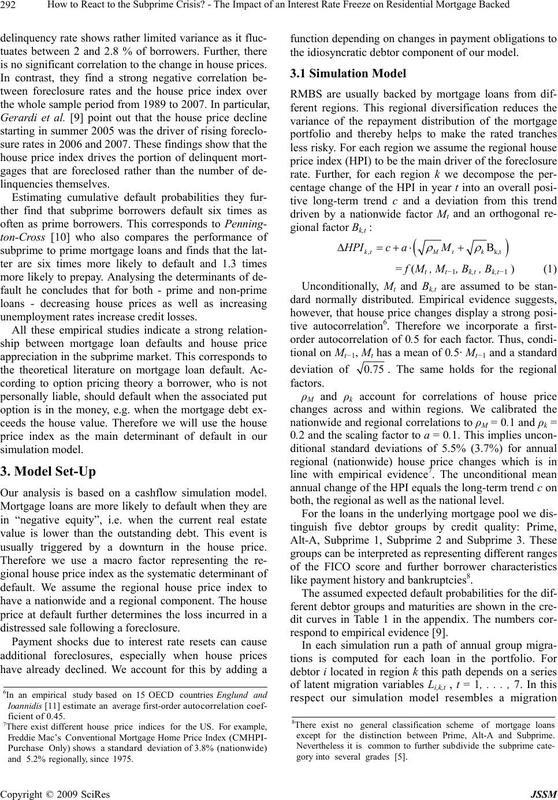 gional house prices and the corresponding expected HPI after three years according to our modeling assumptions. 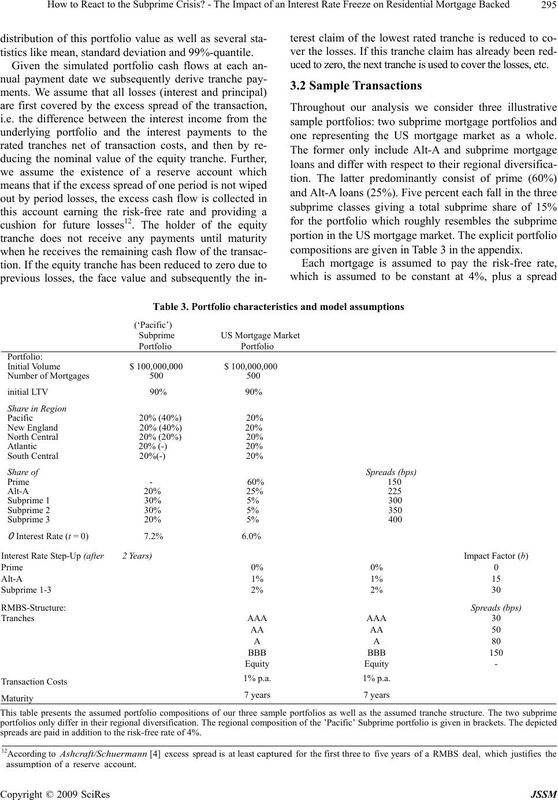 lio, Subprime Portfolio, US mortgage market Portfolio) and four different simulation scenarios. two years and our modelling assumptions. translates into significantly lower discounted cash flows. slightly stronger for the US mortgage market portfolio. costs. We study this trade-off of direct effects first. renders the net effect on most tranches positive. 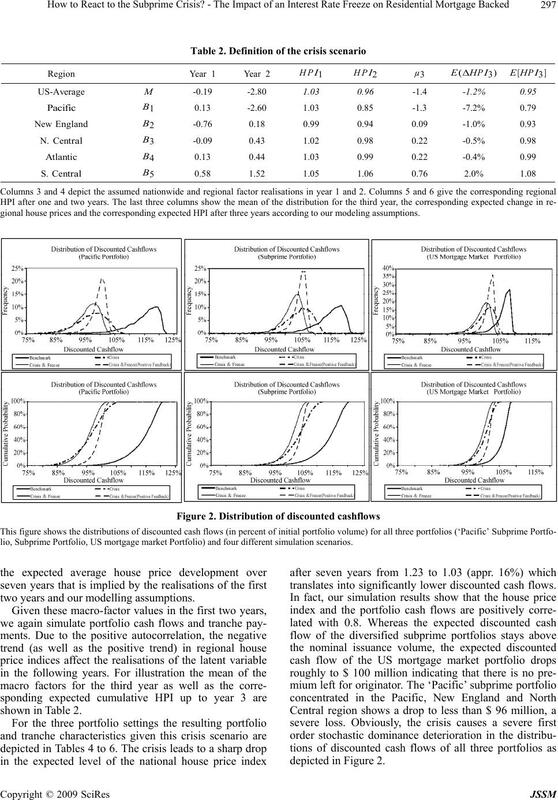 terioration in the distributions of discounted cashflows. whereas all other RMBS tranches suffer additional losses. strongest in this case as compare to the other portfolios. tranches and the equity piece. 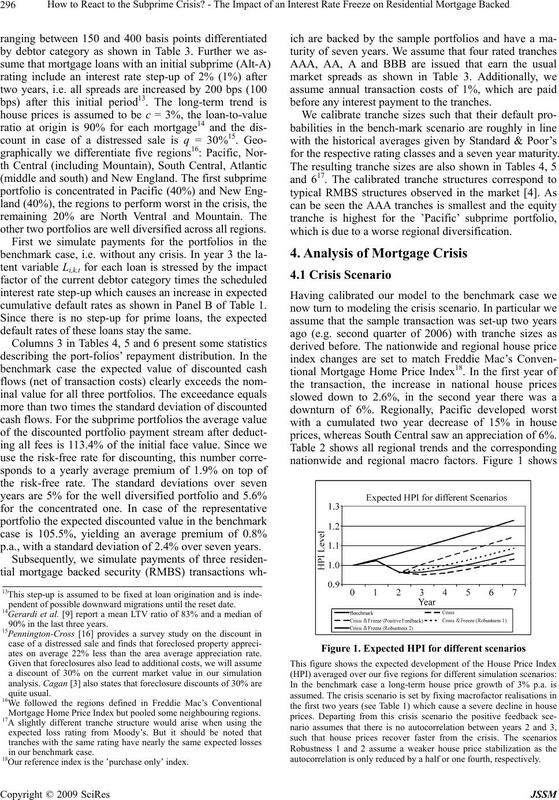 displayed in Figure 2 and Tables 4 to 6.
ing with senior RMBS tranches may recover. tions the net effect of the freeze is positive. rate cuts are an additional policy option worth examining. 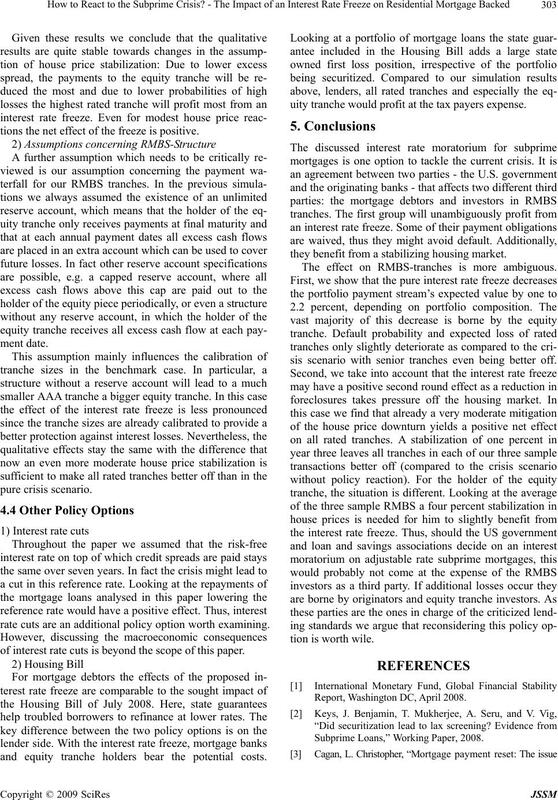 of interest rate cuts is beyond the scope of this paper. and equity tranche holders bear the potential costs. uity tranche would profit at the tax payers expense. they benefit from a stabilizing housing market. 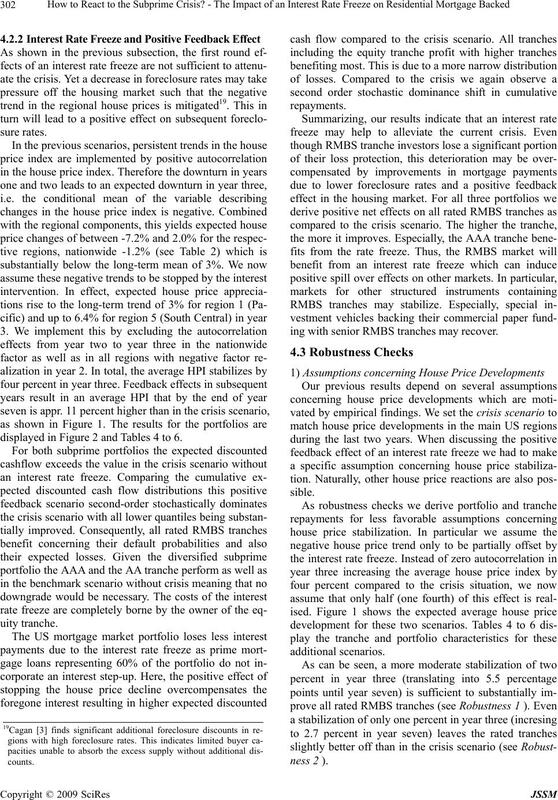 The effect on RMBS-tranches is more ambiguous. 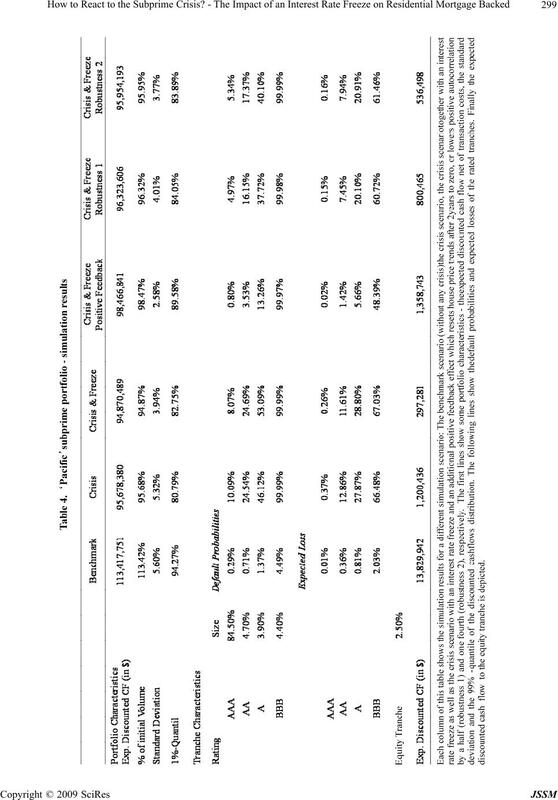 sis scenario with senior tranches even being better off. Report, Washington DC, April 2008. 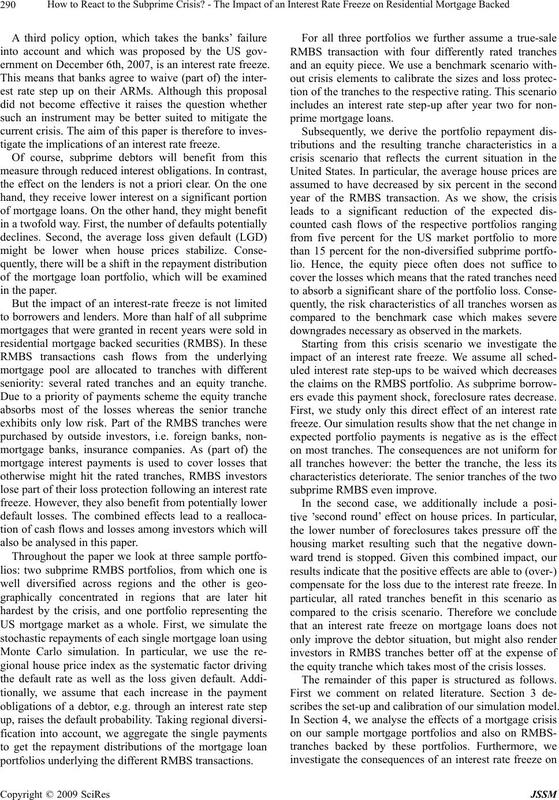 Subprime Loans,” Working Paper, 2008.
and impact,” First American CoreLogic, March 19, 2007. Reserve Bank of New York Staff Reports, No. 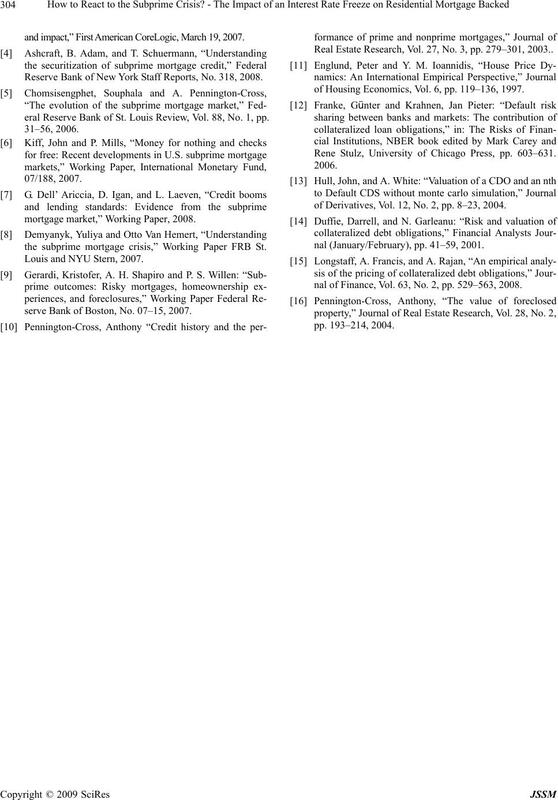 318, 2008.
eral Reserve Bank of St. Louis Review, Vol. 88, No. 1, pp. 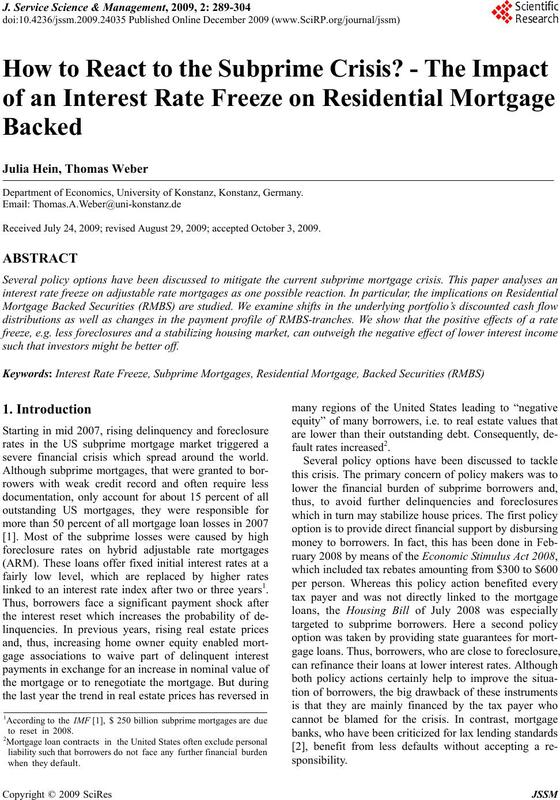 mortgage market,” Working Paper, 2008.
the subprime mortgage crisis,” Working Paper FRB St.
Louis and NYU Stern, 2007.
serve Bank of Boston, No. 07–15, 2007. Real Estate Research, Vol. 27, No. 3, pp. 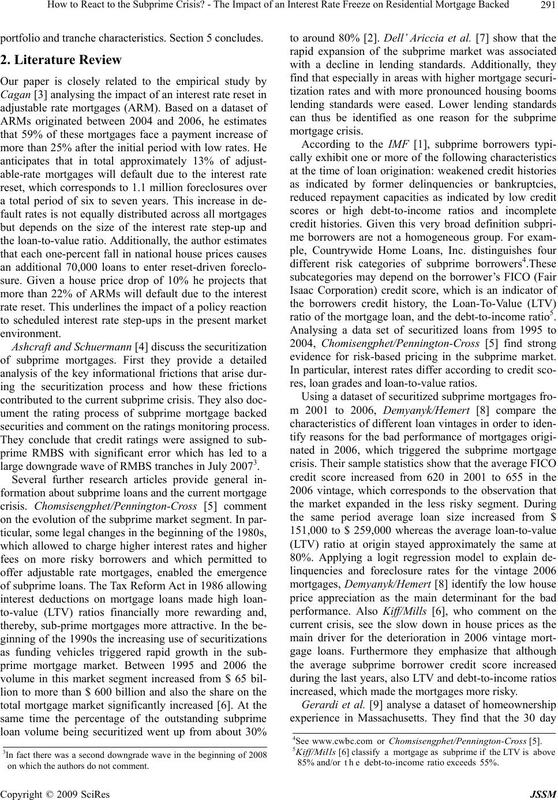 279–301, 2003..
of Housing Economics, Vol. 6, pp. 119–136, 1997. Rene Stulz, University of Chicago Press, pp. 603–631. 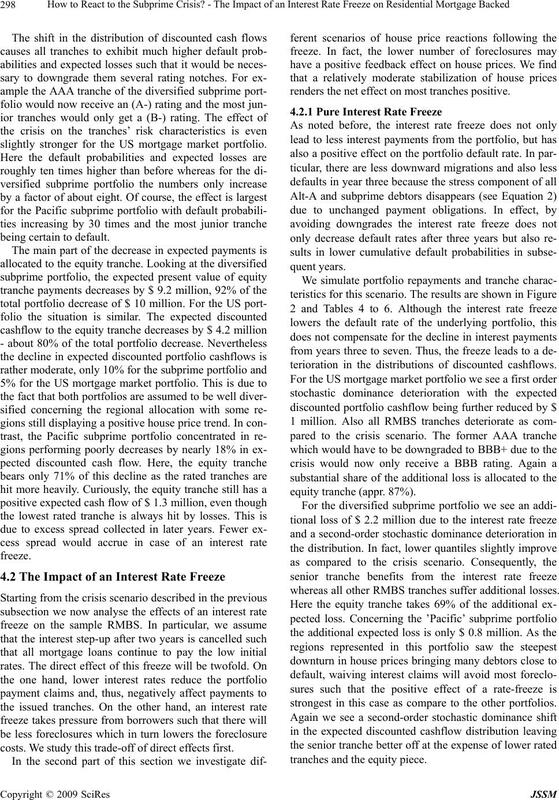 of Derivatives, Vol. 12, No. 2, pp. 8–23, 2004.
nal (January/February), pp. 41–59, 2001.
nal of Finance, Vol. 63, No. 2, pp. 529–563, 2008.